Upon hearing I’m a vegetarian, people always inquire why? Understandably so especially since many know me as a farm girl who grew up riding horses, herding sheep and dipping beef cattle etc. Back home on weekends from boarding school, I’d often be found at the dairy parlor feeding newly born calves. We, like all farmers, consumed copious amounts of meat daily. Naturally, becoming a vegetarian seemed a complete anomaly, and far from my farm girl reality. At 43 years old I was suddenly faced with a choice, and an awakened consciousness so compelling, I couldn’t ignore it. Let me digress a little, in 2007 I underwent a traumatic experience which culminated in me being thrown completely out of my comfort zone. As a result, I departed South Africa for three months with little more than a backpack containing two sets of clothing and headed straight for the Camino, an ancient pilgrimage through northern Spain for some deep soul searching. 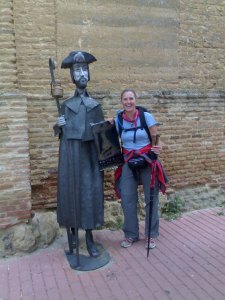 Over a 40 day period I walked in excess of 1,000kms along three separate Camino routes. Ironically, the Spanish translation of Camino means ‘The Way’ and while walking an average of 25 -30 km per day several things became apparent. In hindsight the trauma had indeed provided several significant cathartic yet defining gifts, as if by design a profound healing was set in motion: a healing that was way beyond my own personal sphere. Firstly, I finally embraced the career path I currently pursue in Energy Psychology having avoided it for more than a decade, and within weeks of returning to South Africa I discovered Emotional Freedom Techniques (EFT ‘tapping’). Secondly, becoming a vegetarian! I never intended this given the way I grew up as a typical meat-eating South African farm girl. How did this happen? After completing the Camino I traveled on to Switzerland where a friend gave me a fascinating book to read while touring the Alps (just in case I got bored of the breathtaking Alps). Author John Robbins’ book, The Food Revolution, how your diet can help save your life and our world exposes the myths and dangers about today’s food (typically high-fat diet rich in animal protein and simple carbohydrates such as sugar) and reveals extraordinary benefits of healthy alternatives. This book is an absolute must if you are interested in your health and well being: prevention is better than cure. The abhorrent cruelty aspects of savagely manhandling these innocent, defenseless living sentient beings by keeping them permanently trapped in small, cramped and unhygienic enclosures; force feeding them while also using harmful antibiotics, growth hormones and steroids to stimulate unnaturally fast growth; trucking them under inhumane conditions often for excessively long hours without food or water only to end up at a slaughter house where the ever-present, oppressive stench of death and rotting carcases disturbingly clogs the air for kilometers. Quite obviously, this life-long fear, trauma and torment that consistently courses through the animal’s veins and flesh is ultimately partaken of. Energetically speaking, meat eaters consume flesh that is saturated with all this fear attractively packaged in Styrofoam as healthy protein! Well, I ha dn’t even finished the The Food Revolution, how your diet can help save your life and our world book when I made one of the easiest decisions of my life to become a vegetarian and almost 10 years later I haven’t once regretted or reconsidered my decision. Why? It’s not a question of how long we live, but how well we live! Personally, I’d rather die with a clear conscience knowing in some small way I’ve contributed to the overall health and well being of the planet: animals, forests, water and weather too. This may surprise you: if the ‘powers-that-be’ didn’t control or artificially interfere with Nature by altering our food supply (mechanically, chemically or otherwise), there would be enough natural, ‘real’ food on this planet for every human being to have at least one, if not two healthy, nutritious meal a day … no harmful chemicals, additives, flavourants etc are necessary. When will we WAKE UP and take responsibility for the legacy we have created and will be leaving behind for future generations, either directly or indirectly by supporting the meat industries? In closing, I’ll let C. David Coats have the final word (preface to Old MacDonald’s Factory Farm): Isn’t man an amazing animal? He kills wildlife—birds, kangaroos, deer, all kinds of cats, coyotes, beavers, groundhogs, mice, foxes and dingoes—by the million in order to protect his domestic animals and their feed. Then he kills domestic animals by the billion and eats them. This in turn kills man by the million, because eating all those animals leads to degenerative and fatal health conditions like heart disease, kidney disease, and cancer. So then man tortures and kills millions more animals to look for cures for these diseases. Elsewhere, millions of other human beings are being killed by hunger and malnutrition because food they could eat is being used to fatten domestic animals. Meanwhile, some people are dying of sad laughter at the absurdity of man, who kills so easily and so violently, and once a year sends out cards praying for ‘Peace on Earth’. Love and peace to all sentient beings! Bill Clinton, Matt Damon, Woody Harrelson, Whoopi Goldberg, Ted Danson, Betty White, Brad Pitt, Madonna, Carrie Underwood, Alec Baldwin, Ellen DeGeneres, Portia de Rossi, Russell Brand, Natalie Portman, Pamela Anderson, Paul McCartney, Morrissey, Ozzy Osborne, Prince, Steve Jobs, Brigitte Bardot, Cesar Chavez, Rosa Parks and Jane Goodall. Some international sports stars include Carl Lewis, Mike Tyson, Rich Roll, Bill Pearl and Martina Navratilova. Ironically most people think Vegetarianism is some ‘New Age’ thinking or ‘fashion statement’. It’s a dietary choice; a conscious choice about eating plant based foods rather than consuming the flesh of an animal that was killed simple for man’s selfish reasons.